It is intense, busy, and fast paced - no sleeping thru it. I would recommend the 2 day for someone with little experience with a handgun. The 4 day is better suited for those with more range time, but be prepared to unlearn some bad habits! There are a variety of handguns available (with all necessary equipment) for rental for the courses. Of course, you can take your own also. 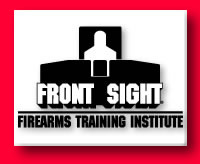 I highly recommend Front Sight, as I would recommend everyone furthering their education with handguns. Would I take the course again? We are already planning on it, as well as for our daughters.